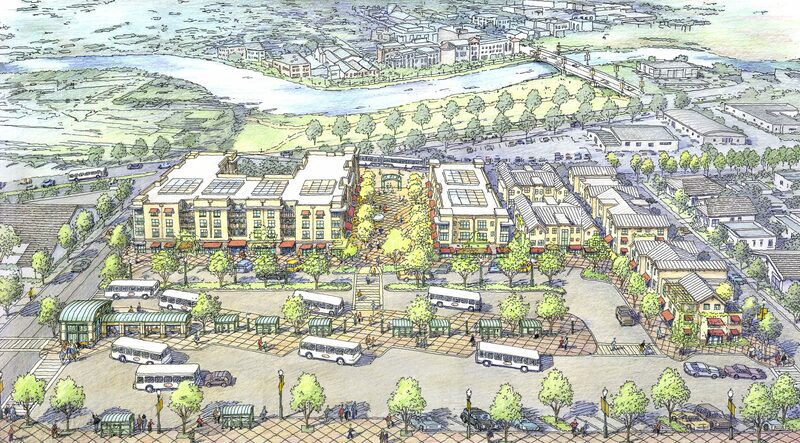 The Napa Intermodal Transit Center Concept Plan provides the preliminary design, circulation plan, budget, feasibility analysis and implementation for a new intermodal transit center and mixed-use development. Joint development of the property, in conjunction with the transit center, will include a series of residential and mixed-use buildings containing transit offices for the NCTPA (local transit authority), approximately 75 units of housing, and 30,000 square feet of retail space. Parking for the development will be located primarily in subgrade structures. VMWP developed a detailed cost analysis and implementation strategy for each of the two final concepts allowing the NCTPA and City to begin identifying funding sources for development of the site. The transit center is a vital piece of the continuing redevelopment of central Napa and the riverfront.